Abstract: Apollo P4X266A chipset maker VIA, had to do something rather drastic for a chipset manufacturer - they had to start selling their own motherboards. With no official support from Tier 1 motherboard manufacturers for the VIA Apollo P4X266A chipset VIA had to do something rather drastic for a chipset manufacturer - they had to start selling their own motherboards. 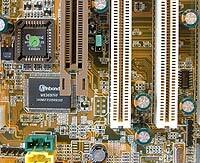 For a company with a focus on silicon chips this is no small task, so while VIA began selling their own motherboards they relied on partnerships with other companies to make them. A handful of large and well known manufacturers are making VIA P4X266A motherboards, but as the boards are only sold to the public by VIA, they are for all intensive purposes VIA motherboards. This was done because most of the big boys didn't want to risk upsetting Intel which had gone to court to try and squash the fledgling chipset which brought DDR to the Pentium 4 ahead of all other chipets. Even now, with the host of P4-DDR chipsets on the market, only a few smaller players have openly accepted VIA's P4X266A chipset into their mainboard offerings. The VIA P4XB-RA is based on the VIA P4X266A chipset which supports Socket m478 400 MHz Pentium 4 CPU's (Williamette or Northwood) from 1.5 GHz to 2.2 GHz+. 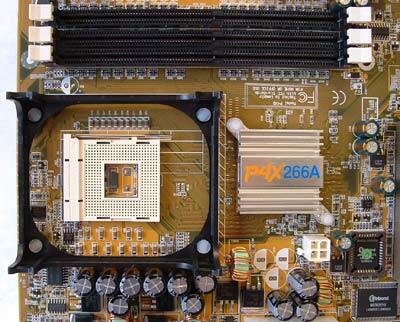 The board has 3 DIMM slots supporting up to 3 GB of non-ECC PC1600/2100 DDR266 RAM (5 banks). While we don't have any 1 GB DIMM's to test with, we did test the board with three 256 MB PC2400 DIMMs and saw no stability problems. The P4XB comes with onboard audio which surprisingly enough, doesn't employ our favorite VIA AC'97 codec. Rather, VIA chose to give users a higher quality sound chipset (no doubt to keep the board from being segmented into the dull value markets) and stuck on the C-Media 8738 which supports 5.1 sound. Like almost all motherboards entering the market this year, the VIA P4XB-RA has an onboard IDE RAID controller care of the fine folks at Promise Technologies. The Promise Fast Trak Lite (20265R) chipset validates RAID's 0 and 1 over the P4XB's Ultra/100 IDE interface. All this goes for a retail price of about $150 CDN, which is pretty good! 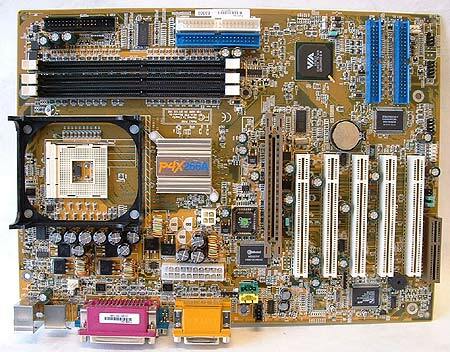 On the rather bland brown PCB, we have a 4x AGP 2.0 slot, five 32 bit version 2.2 PCI's and a CNR. The CNR is pretty much useless since it's almost impossible to buy CNR devices. I say almost because VIA is also targeting the OEM market and large OEM's such as Compaq, IBM and HP, which can use CNR's for cheap expansion peripherals. The placement of the floppy and IDE connectors are in great spots, right next to the DIMM slots so they won't be in the way of any expansion cards. The Promise IDE connectors are down near the 4th and 5th PCI slots which could pose a problem as the cables could potentially interfere with longer PCI cards. The AGP lock on the socket is interesting, and not like any we've seen before. Rather than the usual little white 'switch' at the end of the AGP slot, the socket uses a sliding lock. Basically, there is a piece of plastic that wraps around the entire AGP slot, and when you want to lock the videocard into the slot, you slide the lock to the left. There are a total of two fan headers with one available after CPU heatsink fan installation. Three is usually the accepted number since many of us are using third party chipset/GPU coolers. The other fan header is located at the bottom of the board for a system fan. As I mentioned previously, the onboard audio chipset is made by C-Media and is a 5.1 based hardware solution. We've tested several of these built in soundcards and my conclusions about the onboard C-Media chips are that they offer sound quality on par with a Soundblaster Live! 5.1. I'm not an audiophile but while playing games or listening to MP3's the C-Media 8738 produced very good quality sound. The chipset also has a 32 Ohm earphone buffer. Onboard RAID seems to be all the hype these days and the P4XB-RA has that on its check list of goodies. Relatively old, the Promise Fast Trak Lite (PDC20265R) chipset allows RAID modes 0 and 1 with a maximum burst transfer rate of 100 MB/s. While this is a great feature, the Promise IDE RAID solution can't be used as a stand alone IDE controller like the Highpoint 372 or Award Megatrends IDE RAID controllers. RAID 0 is not considered a true RAID since, there's not data redundancy. RAId 0 takes two drives of the same size/configuration and stripes them, meaning it makes one big drive out of two equal ones. This improves performance by cutting hard drive latency in half. Since the data is divided equally and written on two hard drives it also increases the data bandwidth by two. The reason it's not considered true RAID is because if one drive fails, all data is lost. The IDE sub system doesn't allow hard drives to be disconnected while the computer is still powered up and in use like SCSI can unless you have a special HDD tray. Generally, when one IDE drive fails the system usually locks up anyway. The data is safe since it's mirrored on the other drive which is the real benefit. Promise has developed a special IDE tray that is supposed to allow IDE hot swapping in case you're interested.